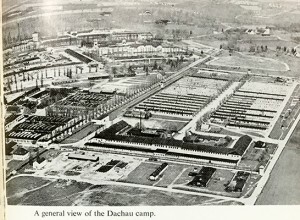 Dachau was the first Nazi prison camp, and one of the most extensive. 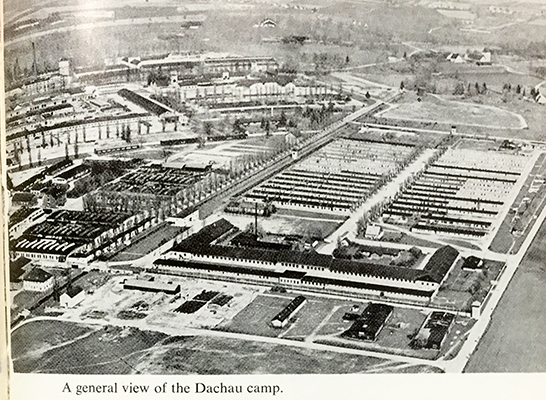 Though not a death camp, thousands died there, from typhus, starvation, medical experiments or summary execution. 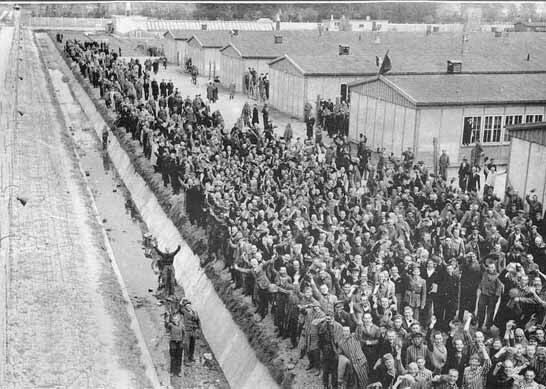 It began as a political prison, but expanded to include Russian prisoners, Roma or gypsies, homosexuals, and thousands of Jews. 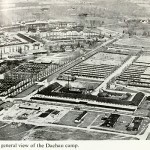 It included the camp system’s only ‘priest block,’ where three thousand priests and ministers were held, some for as much as a decade. 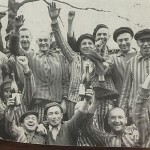 Toward the end of the war thousands of Jews were death-marched into Dachau from Nazi death camps and concentration camps in Poland [edited from “Polish camps”] that were being overrun by the Russians. 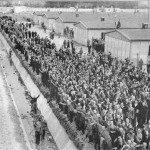 Then, just before the Americans and British reached Dachau, thousands were marched away. 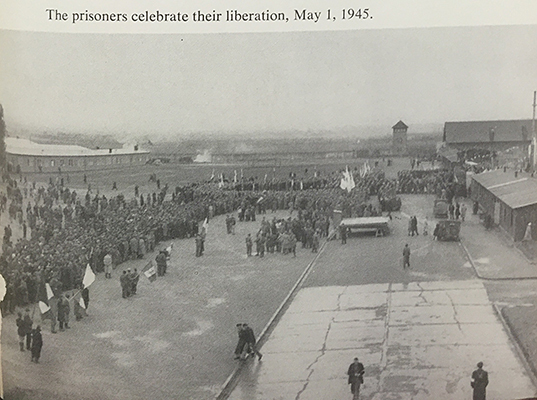 The population of inmates had swollen to almost 65,000, but there were only about 33,000 living prisoners when the Allies finally reached Dachau in April, 1945. 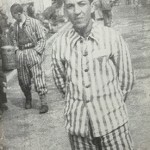 One was a reporter of Turkish and Italian descent named Nerin Gun, one of the few foreign reporters imprisoned by the Nazis for honest reporting. He was moved among eleven camps before reaching Dachau near the end of the war. By the time the Allies approached the camp was a writhing mass, dying of typhus and starvation. 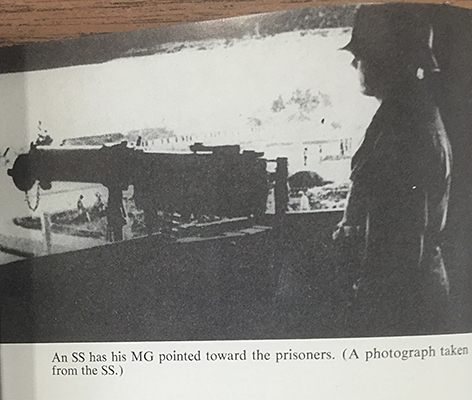 The commandant and most of the guards had fled, leaving only a few German soldiers inside, and the SS guards in their seven guard towers. 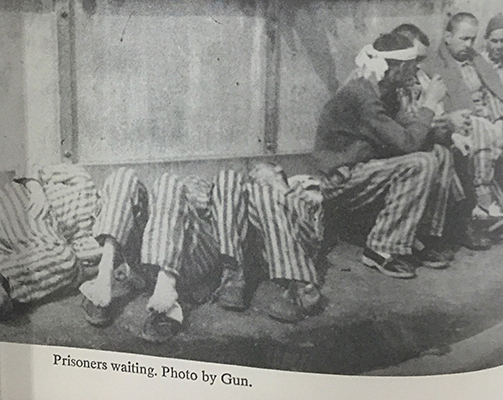 Twenty years later Nerin gun wrote The Day of the Americans, a firsthand account of the liberation of Dachau. Here is a slightly abridged version of Nerin Gun’s account of the American arrival at Dachau. The day is ending and already the shadows of twilight cast a red tint on the rooftops of the SS buildings. Some of the fellows are getting ready for the night. 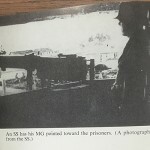 But then, all of a sudden there is a shout from the roof of the neighboring barracks, where one of the prisoners is a lookout. 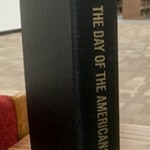 “Die sind da” “Die Amerikaner!” The outcry is repeated, multiplied, blown up, and echoes back to us like the chorus of an opera, a chorus of 33,000 throats. We are now all outside. How we got there I can’t remember. But there we all are— peering at the end of the field, hidden in shadows. The three SS men are still on their tower, but have now pivoted their machine guns the other direction, and they too peer into the distance. Here now, coming from behind a cement-mixer at the edge of camp, an olive-drab shadow, his helmet embellished with leaves and branches, moves cautiously forward, submachine gun in one hand, grenade in the other. He is still quite far away but I can already imagine that I see him chewing gum. He comes cautiously, yes, but upright, stalwart, unafraid. At that moment, for me as for all of us, for all those eyes that now saw him, he was like the cowboy of my youth, the one out of my favorite books and films, whom I was now seeing for the first time in flesh and blood. 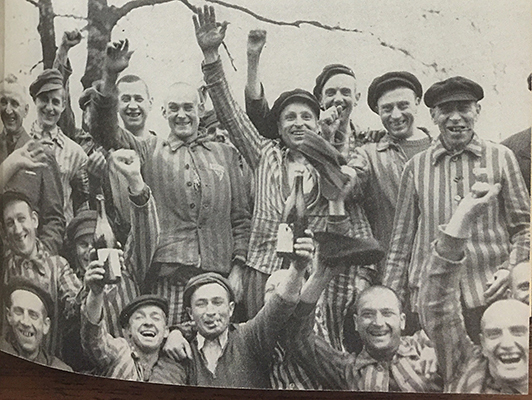 You would have been able to count on your fingers the number of those in Dachau who at any time had known an American or visited the United States. We knew America only through its films. 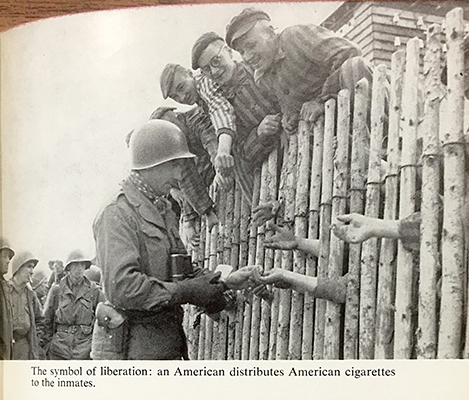 And this first image of the liberation was truly one out of a tumultuous western, shot according to the time-honored rules. 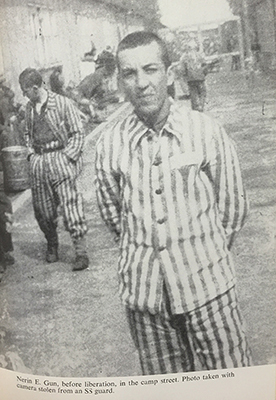 This soldier of the 3rd Battalion, 45th Combat Division, born in the American Midwest of Polish parents and now come to Dachau, was for us, in this moment of intoxication, the very incarnation of the American hero. The silence was broken again by a burst of hurrahs, vivas, siegs and dobres, but all these Tower of Babel voices harmonized to express the same cry of gratitude. 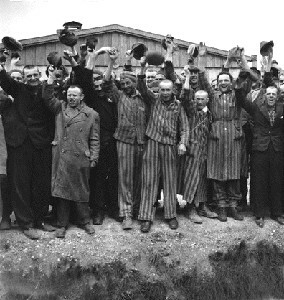 We stood before the fence, up on the roofs; some of us had climbed into trees and raised our arms to the heavens, waving berets, handkerchiefs, some even jackets, shirts, or any random rag; and this mass of humanity, only a few minutes earlier so apathetic, so somnolent, indifferent, exhausted, was now alive with wild enthusiasm. The GI with the somber uniform became aware of our presence. He stopped. He must have seen nothing but a multitude of skeletons dressed in tatters, organized into a frightful dance of death. He was dispatched as a scout and now he was in the entryway of Hell. He discovered there the emaciated, desiccated, haggard faces; the nauseating stench of our bodies and clothing mingled with that of charred flesh coming from the crematorium smokestacks. All this must have struck him like an hallucination. 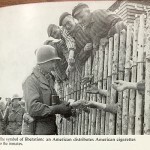 And the man in the olive-drab uniform with the big helmet covered with leaves and branches, who had crossed all of Europe to get to us, shrank back, turned, and went behind the cement-mixer. We had frightened our liberator. First GI at Dachau, we will never forget those first few seconds. Even those of us who have died since you freed them must have carried with them into the other world the memory of that unique, magnificent moment of your arrival. We had prayed, we had waited, we had lost all hope of ever seeing you, but you had finally come, Messiah from across the seas. You had come at the risk of your life, into an unknown country, for the sake of unknown people, bringing us the most precious thing in the world, the gift of freedom. Thank you Jesus that you came, at the risk of your life, to a far country, to a sinful people, bringing us the most precious thing in the world, the free gift of salvation. It is unfortunate that a Christian website would perpetuate lies. 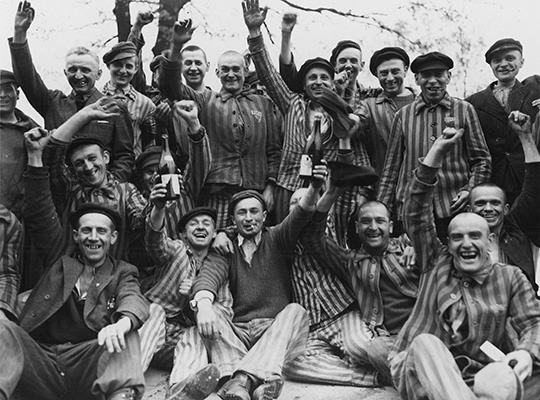 There were never any “Polish camps,” but there were Polish victims in GERMAN death camps. Please make a correction and stop spreading disinformation. Even the Association of German Historians has condemned the use of fallacious terminology such as “Polish camps.” Please learn something from them. Great catch! Several people noticed this. 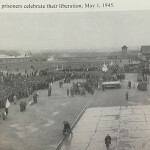 I’ve edited the post to read “Nazi death camps and concentration camps in Poland” I appreciate the correction and I apologize for my sloppy wording. Sometimes I’m too enthusiastic about condensing my posts. “Nazi-German camps in occupied Poland” This is important as people will read the book in future generation, who will not know the mistake. 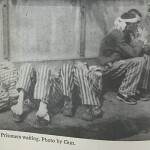 What do you mean by “Polish camps”? As far as I know, there were no Polish camps during WWII. 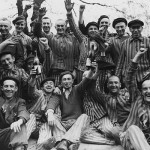 There were thousands of German camps in Germany and many occupied countries.